I have only run on the track twice this year. “That’s heresy!” you say? Yes, it is true that triathletes have a strange fixation with the track. I, too, have done hard time on the track, running up to two workouts a week going around and around and around the oval. This year, I shied away from the track, instead running intervals on the trails, roads and bike paths, with occasional treadmill workouts thrown in when the weather was uncooperative. Certainly the track has its merits. 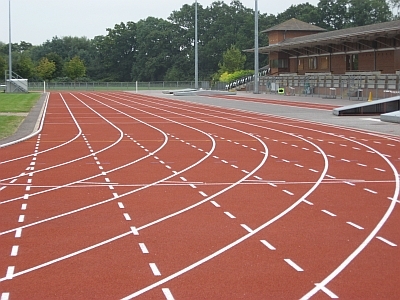 It is flat, usually a cushy surface, and the length is perfectly measured (disregarding the track near my house which is uphill on the first turn, paved with precarious cracks all around, and it is slightly longer than 400 meters. It is, however, where we run our annual beer mile). You don’t have to worry about stepping on dogs or avoiding oblivious walkers. With a large group, running on the track keeps everyone together. I contend that breaking away from the track for some workouts is refreshing and may even save your legs. The constant strain on the inner leg is never quite equalized by running the recovery in the opposite direction. Running on the track somehow beckons for running faster than one should actually run. If a workout calls for 5k pace, doing it on the track will invariably result in times much faster than one can conceivably hold for 5k. Look, I am just as guilty as you are of running too fast on the track. And, who doesn’t get workout anxiety when there is a hard track session on the schedule? Somehow, 8×800 on the track is far more intimidating than 8×3 minutes (or thereabouts) on a lovely trail, even though both are virtually the same. Now, I am not saying to avoid the track altogether. The track is perfect for shorter, faster intervals; or, if you cannot find a flattish stretch of road to run on; or, to just do a workout every now and again. But, with GPS watches, it is easy to measure out any distance you want to run and check your pace obsessively at all times. This year, I have run intervals from 30 seconds up to 10k in training. My trusty watch keeps me in check, so there is no guess work involved. I know my target pace for each workout, before I start, and I do my best to hit those paces. By extricating myself from the track and running on the roads (or trails), I believe I am preparing my legs better for racing. All of the places I have done my intervals are undulating and canted, similar to the conditions of the races I intend to run. It is comparable to riding your bike on the road vs. the trainer. Next time you head to the track, test out the road instead and see what you think.